Prepare yourself for your most epic mountain biking adventure yet! 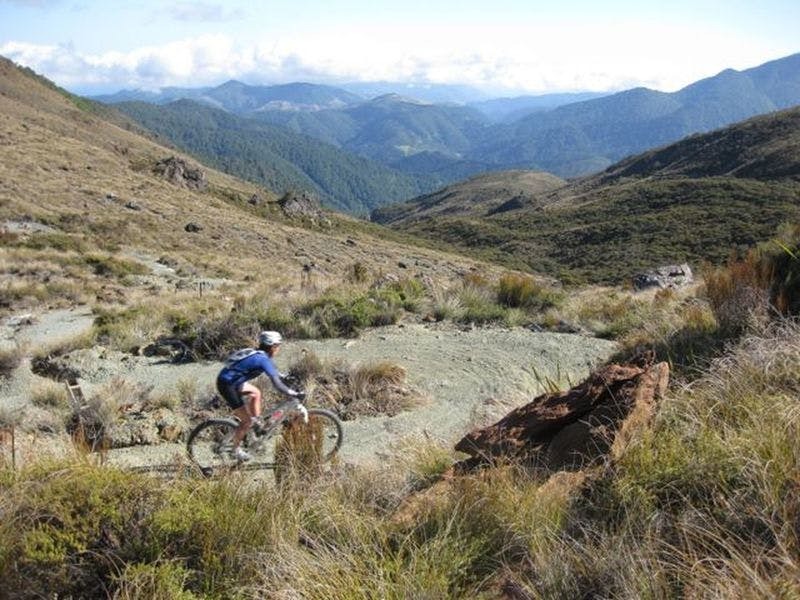 This is your opportunity to live the dream: a guided MTB adventure holiday across New Zealand. The best of the North. The best of the South. They both come together over an epic 16 days to create the ultimate adventure: the pinnacle of mountain biking in New Zealand – some say, the world! Take in the lush forests and epic, adventurous trails of the North Island, and complement it with the high country tracks and purpose built parks of the South Island. Add an extra dose of awesome by including some of our fantastic add-on options such as Heli-Biking, MTB Skills Clinics, bungy and skydiving to name a few. From perfectly flowing single-track of Taupō, to the the white-knuckle rock rollers of Alexandra, not forgetting the purpose-built parks of Queenstown and Rotorua, our expert guides will take you to the meccas of New Zealand mountain biking, as well as the spectacular spots that you've never heard of! The North Island offers a smorgasbord of landscapes: one day we’ll be riding through a labyrinth of towering ferns and redwoods, the next, we’ll traverse lakeside vistas and a volcanic plateau and soak in geothermal hot springs. By the time you hit the South Island, you’ll have found your flow and form and you’ll be amped to tackle the alpine tracks and trails! But no two mountains or MTB parks are the same: one day we’ll be riding through tussocky backcountry, the next, we’ll ascend via gondola, the next we’ll take on lakeside vistas and craggy alpine pioneer tracks. You’ll conquer mountains and your own limits! In the evenings on the tour you’re welcome to relax at the accommodation, rest your legs and soak in the local hot tub(s), cook in, eat out, have a beer or even some more night riding. At the end of each day of the itinerary, we’ve included an example of one of our guest's ride statistics for that day – this is just a rough guide, and may include uplifts. You might decide to do more or less riding, it’s always your choice. 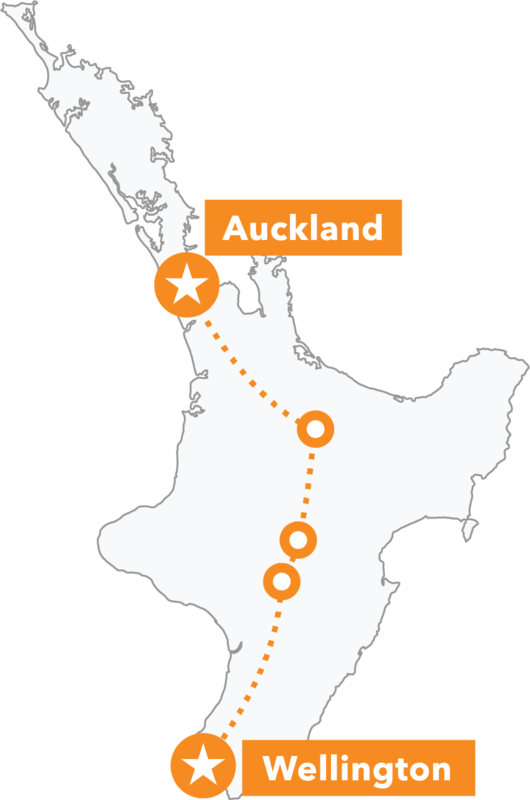 As the tour starts early in the morning you can opt to stay at our Auckland accommodation the night before the tour – only having to walk downstairs on Day 1 makes for a stress free morning. 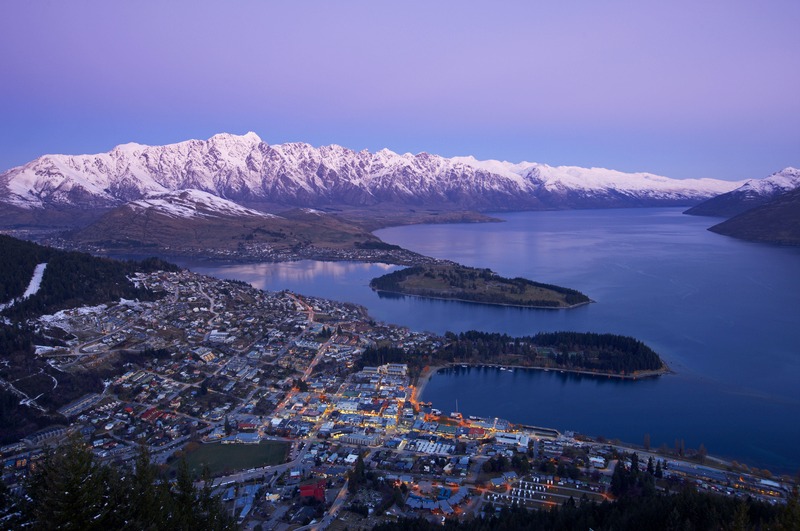 Likewise, you can book an extra night at the Queenstown accommodation on day 16 to enjoy even more of Queenstown. As you build your tour online, you’ll see a few optional activities available to add – remember, none of these are compulsory. Not sure which activities to choose? No problem. Once you’ve paid a deposit and secured your seat you can add activities anytime until 45 days prior to departure. Your Haka MTB Guide can also book activities for you while on the road. We can't guarantee availability when booking at the last minute, so if you have some must-do activities, pre-booking is a great idea. We try to fit these activities around our riding but some additional activities may clash with riding times – check with us if you're unsure. Accommodation on tour is dorm-share, but if you like your own space you can upgrade your accommodation to a private room. Master crafted trails, unbeatable riding surfaces, well draining volcanic soils, varying topography and panoramic scenery, we’ll explore one of the world’s premier riding destinations. An epic MTB park accessible by gondola, some incredible alpine rides and all the bucket-list activities you could wish for: challenge accepted! The mineral-red tones of Nelson’s Coppermine Loop/Dun Mountain’s unique geology contrasts with the lush green and golds of the Abel Tasman National Park in the background. We’ll meet, have breakfast and then get on the road. A few afternoon laps around Rotorua’s world-famous Whakarewarewa Forest for a tour warm-up sounds about right! Today you’ll discover exactly why Rotorua is renowned as one of the world’s premier riding destinations. Tonight we enjoy a magical Māori Cultural Evening and hāngī meal. You’ll master seriously world-class tracks today! We’ll ascend via gondola and descend via tracks used for the annual Crankworx event. A hot pool soak & a BBQ round off the day. This morning we’ll ride purpose-built tracks through native bush between two beautiful bays then take a steady climb to a headland with inspiring views across Lake Taupō. Our most remote North Island ride includes stunning scenery, suspension bridges, intriguing history and an exhilarating shuttle on the The Bridge to Nowhere Track. Opt to take an early-morning spin on the Old Coach Road before we cruise down to the nation’s capital. Wellington’s amazing range of eateries and drinkeries await! Early birds get a preview of what’s to come on a quick ride with views across to the upper South Island. 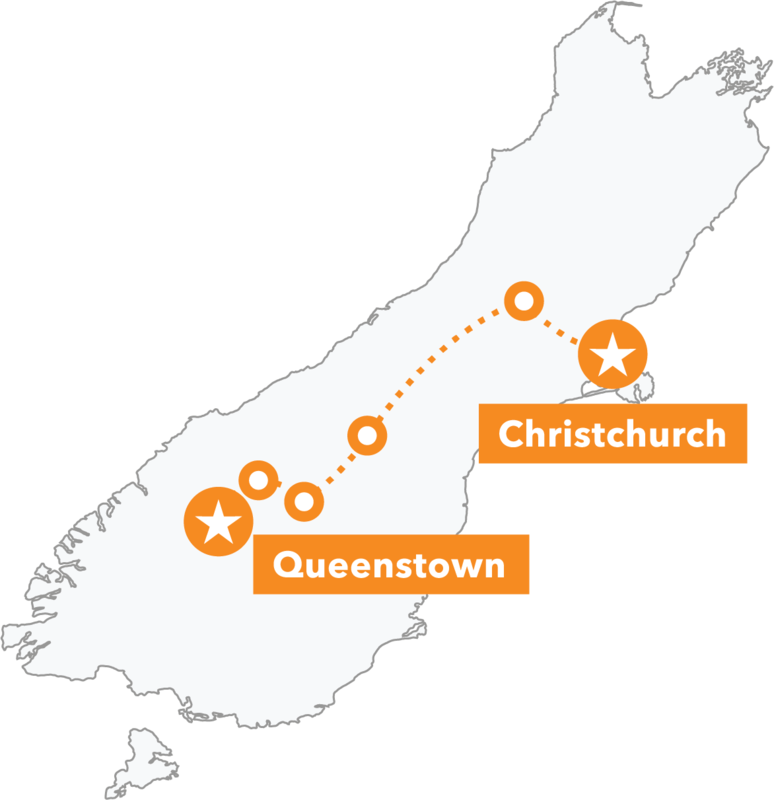 We’ll then catch the Cook Strait ferry to our southern adventures. Stunning XC and a singletrack descent that drops for over 10 kilometres are on your agenda today. Later, we’ll take a stroll to the geographical ‘Centre of New Zealand’. Sit back, relax and enjoy the scenic drive down to Christchurch. Get your camera ready for the drive over the Southern Alps via the dramatically beautiful Lewis Pass. We’ll tackle some XC and DH trails that only the locals know, enjoy a few laps of an adventure park before we relax at our alpine lodging with the possibility of a night ride! Hold on to your handlebars as we cross limestone rocks and gold tussock on a true alpine track pioneered for ski tourism over 75 years ago before MTB was even a thing! We’ll spend our morning exploring Mount Hutt’s multi-line trails before we’ll wend our way to Wanaka, taking in views of Lake Tekapo and Aoraki Mt Cook. 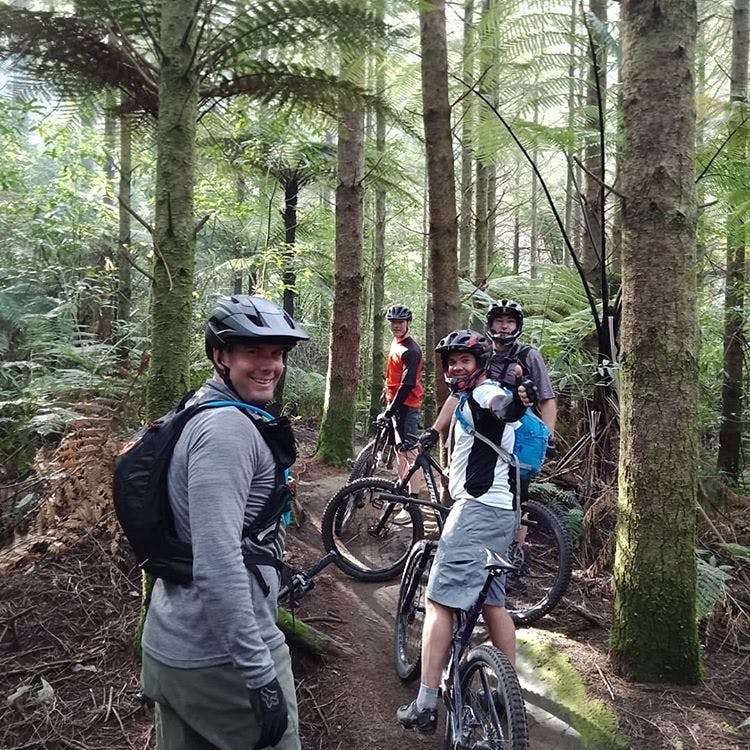 Enjoy a morning jaunt through pine forest on lakeside trails built and maintained by the local MTB community before we head to the South Island’s best kept secret: Alexandra! Strap your bike to a gondola and take on the legendary challenges of the Queenstown Bike Park, or opt for some heli-biking, a bungy, a sky-dive or a Milford Sound side-trip! Savour every moment as the end draws nigh! Blast around and down some of Queenstown’s top tracks, do some lakeside laps and enjoy Queenstown’s energy and nightlife. Time to say goodbye, but we’ll end on a high! We’ll circumnavigate picturesque Moke Lake and enjoy serene lake country views, clear alpine air and high country trails.